Paul Moore also produced a line of kits, called "Little Scoots", which were designed to fit onto the mechanism of an Athearn Hustler locomotive. This four wheel locomotive was an inexpensive avenue of entry into model railroading, and the Little Scoot offered a low cost way of producing models of electric traction, both streetcars and intercity cars. The small size of the Hustler mechanism allowed for operation on tight radius curves, which meant that a very small model railroad could be produced. The Little Scoots were caricatures of their prototypes, but all the elements were there. 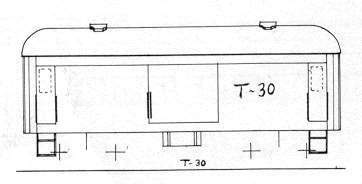 Although some catalog drawings show axle centers for two pair of trucks, cars such as this Niles Car inspired interurban (above) were designed to also be fitted to Hustler frames, providing the model railroader with an inexpensive streetcar. There were many cars in this series.